Being Frugal and Making It Work: Get $5 When You Sign Up For Swagbucks ~ Please Join for FREE and be my Referral! 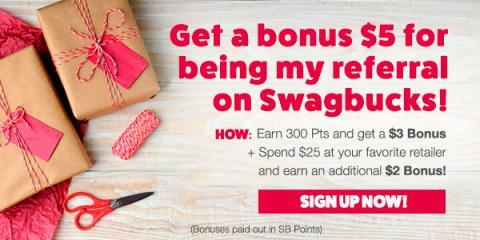 Get $5 When You Sign Up For Swagbucks ~ Please Join for FREE and be my Referral! Whether you like it or not, we've reached the Holiday season - can you believe it? People are already preparing for Thanksgiving and getting ready to start shopping for the Holidays (if they haven't already begun)! Since this time of year in particular is a good one for having some extra money, Swagbucks is offering a $5 bonus to people who sign up through me this month! Swagbucks is a rewards site where you earn points (called SB) for all sorts of things you're probably already doing online, like shopping, discovering deals, taking surveys, watching videos, and more! Then you can turn your gift cards in to PayPal cash or gift cards to places like Amazon, Starbucks, and more! 2. Earn 300 SB total before 12/1. You'll get a $3 (300 SB) bonus for it! That's it. It's super easy, and Swagbucks is for real. I use it myself, and I've earned over $900 using Swagbucks! I currently earn between $25 and $50 each month and it really adds up. Once I redeem my Swagbucks for a prize, it usually takes less than a week for them to arrive in my inbox. I'm always impressed with how quickly they send our rewards. I "bank" and save my rewards all year long and redeem them for "FREE" Christmas gifts for the kids! The kids are always thrilled with their gifts and I'm happy that I was able to stick to our holiday budget and not break the bank! You can fill out a survey profile and then answer additional questions that will help Swagbucks deliver surveys that you're more likely to complete. You get 2 SB for every 10 questions you answer! If you haven't already signed up for Swagbucks, you should join for FREE and become a member TODAY! Let Chewy.com Send Your Pet the Perfect Treat! 52 Things That I Am Thankful For... A to Z! Get great deals when shopping for home decor!